With the campaign to recall Gov. 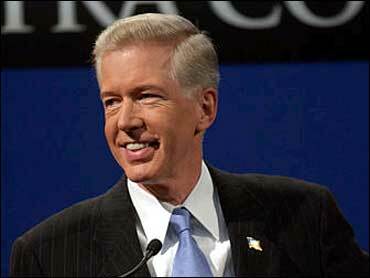 Gray Davis just over a week away, a new poll indicated the Democrat could lose office by a wide margin and put Arnold Schwarzenegger way ahead of everyone else trying to become governor of California. Schwarzenegger barnstormed around California on Sunday, appearing before enthusiastic crowds in airport hangars. "This is now hand-to-hand combat. We are in the trenches. This is war," Schwarzenegger said, adopting a newly aggressive tone. CBS News Correspondent Sandra Hughes reports Davis has taken off the gloves and is aiming at his main opponent in newly released negative TV ad. The new spot accuses Schwarzenegger of ducking tough questions and refusing to debate. The governor himself tried to stay above the fray Sunday, signing several bills dealing with health care reform and patients' rights. All the other major replacement candidates gathered for a forum in Sacramento, where Lt. Gov. Cruz Bustamante endorsed a proposal for public funding of campaigns. Some of California's major newspapers made endorsements Sunday, most urging voters to reject the recall on Oct. 7 and recommending nobody to replace Davis. "Davis is lucky: there are no replacement candidates worth a recommendation," wrote the San Jose Mercury-News. The endorsements came out as the poll taken after last week's pivotal candidates' debate indicated sharp differences with previous surveys, which showed a much narrower margin of Californians favoring the recall, and an even race between the Republican actor and Democratic Lt. Gov. Cruz Bustamante. Davis's campaign spokesman, Peter Ragone, attacked the numbers. "It's a joke," Ragone said. "It is so far from what every other public poll and every other internal poll by both Democrats and Republicans have found." Schwarzenegger planned to focus his message on the governor's failings during his flyaround campaigning Sunday. "We plan to spend the rest of this campaign reminding voters that the real question of the election is whether or not they want the status quo in Sacramento, with the government controlled by special interests or whether they want real change," said his spokesman, Todd Harris. The CNN/USA Today/Gallup poll released Sunday had 63 percent of probable voters saying they would vote "yes" on the recall question, and 35 percent voting "no." Schwarzenegger was the choice of 40 percent, Bustamante 25 percent and Republican state Sen. Tom McClintock 18 percent of those surveyed — suggesting Schwarzenegger could become governor even if Republicans split their vote. If a majority of California voters decide to oust Davis, whichever replacement candidate gets the most votes becomes governor. The poll of 787 registered voters used a model for probable voters that assumes a relatively high 50 percent turnout among the state's voting age population. It had a margin of error of plus or minus 4 percentage points, and was conducted Thursday through Saturday, CNN said. Schwarzenegger touched down in the tiny central coast town of Santa Maria on Sunday, speaking before a crowd of about 1,000 people in an airport hangar. Although the Schwarzenegger campaign aired anti-Davis ads all last week before the governor began responding in kind on Friday, the actor warned supporters to be on the lookout for Davis to go negative. "Desperate Davis is going to do all kinds of tricks, he is going to do all kinds of tricks, he is going to start a dirty campaign now, we know how he is," Schwarzenegger said. The candidates' forum in Sacramento, sponsored by Asian Pacific Islander American Political Association, included debates about the recall and another ballot question, Proposition 54, which would bar the state from collecting racial data. Bustamante's endorsement there of the public financing proposal follows criticism that his campaign has accepted almost $4 million from Indian tribes and labor unions. The Los Angeles Times, Mercury News and Sacramento Bee each urged "no" on recall and made no candidate recommendations for the second part of the ballot. The San Diego Union-Tribune editorialized that recalling the governor would set a dangerous precedent, but said Davis' performance demands his removal and endorsed Schwarzenegger. The Oakland Tribune urged readers to vote "no" on the recall, but also endorsed Schwarzenegger.